These are the most beautiful tropical islands in the world, thanks to their geography, the lush vegetation and the clearest water anywhere. Hawaii receives more tourists in two weeks than Tahiti receives in one year. No big hotels in Tahiti (nothing taller than a coconut tree – its the law), very few tourists to be seen and all of this magical environment basically all to yourself. Very easy overnight flight: 7 1/2 hours from L.A. The lagoon: nature’s swimming pool, generally shallow with very clear water…an ideal place for “Discover Scuba” lessons or for gaining more proficiency in scuba techniques. The oceanic drop off: the part of the reef that is most alive with amazing varieties of corals, colorful fish and larger predators. The passes: These natural openings in the barrier reef connect the lagoon with the ocean, always contain large concentrations of large fish and are the cruising zones of big manta rays and sharks. There are numerous species of marine life in these waters, from small butterflyfish with dazzling colors in coral gardens, to bigger fish such as Napoleon wrasses, manta rays, reef sharks, tuna and large schools of jack, snapper and barracuda. Prepare yourself to see some of the most spectacularly beautiful islands in the world, which means “Bring lots of film!” You’ll encounter many big animals underwater, and even beginning photographers have the opportunity to capture great shots. Above water, set aside some time for sightseeing or maybe an island tour with a local safari company. It will be worth it! Located at the InterContinental Tahiti Resort, this PADI five-star dive operation provides access to the island’s top dive spots. Both sides of Tahiti are readily accessible, providing versatility in response to weather conditions. Boasting 3 dives a day, 7 days a week, Aquatica is passionate about exporing Tahiti’s underwater wonders. 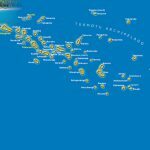 Day trips to Moorea and/or Tetiaroa may also be arranged. Two boats with 16 and 9 seats allow for 25 divers per dive. Back at the traditionally constructed dive center, hot showers and towels will be at your disposal. Enjoy the private beach while you wait for your next dive. A range of SCUBA courses (from Discover SCUBA through instructor-level classes) are taught by CMAS and PADI certified instructors. Diving school for kids is also available. Night dives, deep dives, two-tank dives and nitrox are offered. Guided snorkeling tours are available for non-divers. Aquatica is an authorized Scubapro SEA center. Located at the charming Les Tipaniers Hotel, Scubapiti is a small dive shop operated by friendly and extremely knowledgeable divers. Daniel, the owner, and his staff emphasize safe, enjoyable diving and are passionate about sharing Moorea’s natural underwater wonders with guests while keeping conservation a top priority. A comfortable 28 foot boat holds up to 14 divers. Two exploration dives are done in the morning at 7:45 and 10:00am. An initiation dive and/or certification courses begin at 1:30 pm. 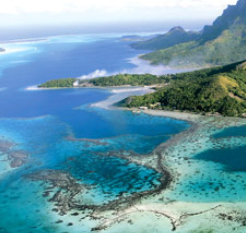 Scubapiti is conveniently located for most accommodations on the North and West coasts of Moorea. Discover Scuba and Level 1 certification courses are available. The first two lessons take place in the lagoon, while the following lessons progress to the ocean. Personalized photography is also offered. Take home a CD of high resolution photos of all of your dive highlights! Located at the InterContinental Moorea Resort and Spa, this PADI five-star dive operation lies within ten minutes of all of the best dive sites on the island. Comfort, service and security are Bathy’s top priorities. Inside the dive center you’ll find a dive shop for all of your necessities and souvenirs, as well as changing rooms, bathrooms, lockers, a lounge and a video room with plasma screen to relive your dives. All equipment is Aqua Lung. For an added level of safety, nitrox and computers are available. Enjoy the ultimate souvenir….take home a high-def video of your dives filmed by a professional cameraman! Two spacious boats, one 35′ and one 27′, accommodate 24 and 12 divers respectively. Three departures a day are scheduled. Most divers do two dives a day, either two tanks in the morning or one in the morning and one in the afternoon. The 8:00am and 10:00am dives are usually outside the reef, while the 2:00pm dive is usually in the lagoon. The full range of PADI instruction and certification is offered, including specialty and advanced courses, such as Underwater Videographer and Rescue Diver. With two locations, one in Matira on the beach of the Novotel and Sofitel resorts and one at the Le Meridian on the motu Piti Aau, Nemo World is ready to show you the breathtaking underwater scenery and gorgeous island views that make Bora Bora “The Pearl of the Pacific”. Nemo World boasts a fleet of 3 boats, the “Teaotea”, a 40×16 ft catamaran that comfortably accommodates up to 20 divers, and two large aluminum boats, the “World” and “Api”. All equipment is Aqua Lung. Morning and afternoon dives are scheduled daily. Two-tank dives are common. Pick-ups and drop-offs from your resort dock are included. 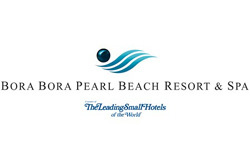 Located at Bora Bora Pearl Beach Resort, Bora Bora Blue Nui has been sharing the island’s exceptional underwater scenery with lucky guests since 2000. The dive center, located 20 yards from the arrival and departure dock, offers Sherwood equipment, tank fills, a large open room for conversing with instructors or viewing video of your dives, a rinse tank, showers and personal lockers. Two covered aluminum hull boats, the 28′ Te Matagi and the 23′ Te Ou’a, carry 15 and 11 divers respectively. Two-tank dives are scheduled every morning, with an additional dive available in the afternoon. Night dives may also be arranged. Fun dives or lessons are available for beginners. On the white sand beach near Hotel Kia Ora, a traditional fare faces the lagoon. This is The Six Passengers dive center. Aqua Lung and Scubapro equipment is available for use, and as the Six Passengers is a Scubapro Center, all equipment is replaced every two years. Introductory through advanced PADI and CMAS courses and certification are also available. Three twenty-foot zodiacs, one with a hard bottom for long distance excursions, are all equipped with powerful motors for speed. All boats accommodate up to 6 divers each. Several outings are available every day, and night dives are also possible. All dives are professionally filmed with copies made available for purchase. Experience the thrill of “shooting the pass” as an exhilarating rush of water carries you and an astounding number of fish between the lagoon and the ocean. 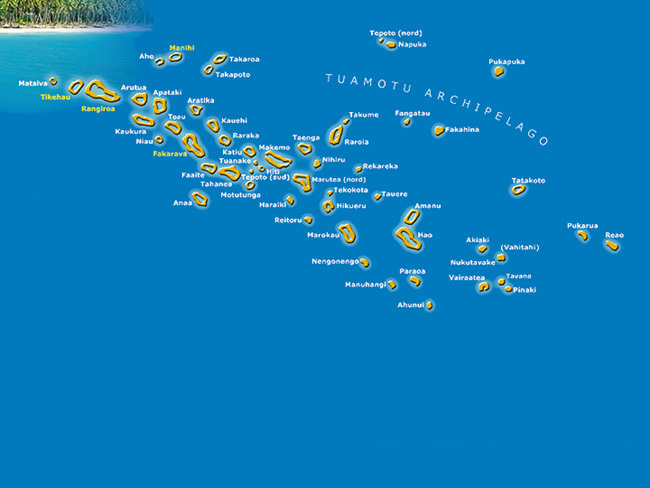 The top dive sites in Rangiroa are centered around two passes: Avatoru Pass and Tiputa Pass. Triggerfish, Butterflyfish, anemones and many more species of tropical flora and fauna will greet you on this relaxing dive within the protected lagoon of Tahiti. Very shallow and extremely clear, this is an excellent introductory dive. Just a few kicks away from The Aquarium, you’ll come upon a trench in the lagoon. Within the trench, only a few yards apart, you’ll find two perfectly preserved wrecks: one is a seaplane that sank in 1962 and the other is a schooner that sank in 1976. On the outer side of the reef, a coral plateau 15 ft down overlooks an impressive and dizzying drop. Two narrow faultlines about a hundred yards apart make notches in the plateau. These notches are approximately 100 ft deep and hide an amazing variety of colorful tropical fish, multicolored coral polyps, anemones, and crabs. Keep an eye out for the Napoleon wrasses and dogtooth tuna that frequently cruise the reef and make sure to check the crevices for resting turtles and sharks. This site owes its name to the numerous orange gorgonians and black coral that cover a vertical and sometimes overhanging wall of the outer reef. A dive light brings the colorful beauty of this spot and the multitudes of small fish that call it home into full view. A little ways away, at 90 ft, the cave of Arue can be found. Wide enough to allow the passage of a group of five divers abreast, this cavern hides lobsters, schools of rockfish and crayfish. A freshwater spring bubbles up from the ocean shore near a coral outcrop close to the surface. Look for nurse sharks, Napolean wrasses and a variety of invertebrates inside the numerous cavities and grottos in the outcrop. This is one of Tahiti’s richest diving spots. The barrier reef protecting the lagoon drops off into a gigantic vertical wall covered with yellow gorgonians. Dense schools of anthias, barracuda and jacks swim near the wall as dogtooth tuna and sharks, your constant companions on outer reef dives in French Polynesia, cruise by. Perfect for beginners or for those who want to reacquaint themselves with the underwater world before moving on to more challenging dives. Parrotfish, clownfish, anemones, angelfish, butterflyfish, trumpetfish, puffers, white tip sharks and a large group of eagle rays make this relaxing dive an enjoyable one. This spot is famous for its ultra clear water and dense populations of black tip, grey and lemon sharks. If you can manage to take your eyes off of these impressive creatures, you’ll also see blue-striped snapper and barracuda. As this dive site is close to Tiki Point you’ll no doubt see more sharks. The highlight here though is a magnificent coral garden where you can usually spot several turtles as well as a host of Emperor Angelfish, paddletail snapper and Moorish Idols. Feeding time for hungry sharks! This adventurous decompression dive is only for advanced divers! Following a stunning descent into the blue, you’ll be rewarded with the sight of giant coral roses that seem to go on forever. A few sharks will also be taking time to “smell the roses”. Enjoy black tip sharks, rainbow jacks, giant trigger fish and huge moray eels above an undulating garden of coral. Enjoy the gentle lagoon as multiple manta rays gracefully glide within arms reach. Explore small caves, swim-throughs and coral walls. Giant clams, eagle rays, anemones, moray eels, butterfly fish, triggerfish and multitudes of other colorful fish abound. A wide variety of sea-life passes in and out of the lagoon here. Sharks, eagle rays, manta rays, moray eels, jacks and giant Napolean wrasses are framed by a background of purple and yellow coral walls. Grey sharks, turtles, tuna, jacks, schools of barracuda and dolphins are all known to frequent this breathtaking section of the coral reef. Blue and red branching coral and green and orange sponges add color to steep walls, caves, tunnels, corridors, and swim-throughs. Drift along with turtles, sharks, and barracuda. This spot is famous for the 8-9 ft silvertips that swim up the wall and across the top of the reef as the current moves from the lagoon to the ocean, bringing with it tasty morsels. Also spot turtles, Napoleon wrasses and schools of barracuda and jacks. This deep gulley is framed by a coral garden and features manta rays, barracuda, sharks, and numerous free-swimming morays. The cave and canyon topography here provides interesting terrain for sightings of Napolean wrasses and grey sharks. This dive site within the lagoon is one of the tamer dives in the area, but the tranquil beauty and variety of species you’ll find are well worth your time. A coral garden, butterflyfish, anemones and clownfish, triggerfish, Napoleon wrasses, white tip sharks, grunts and many more species of tropical fish are the highlights here. Hammerhead sharks and eagle rays frequent this large flat area to the side of the pass as abundunt numbers of fish are sucked into the lagoon on an incoming tide. At this open-water dive site just outside the pass, you’ll find amazing numbers of hungry grey reef sharks, white tips and hammerheads circling curiously around divers at 100-120 ft. At a shallower depth, Napolean wrasses and schools of snapper and barracuda will attract your attention. Caves and canyons, Napoleon wrasses, grey sharks, eagle rays, barracuda and dolphins. When the current is on its way out, this coral garden just outside the pass is a nice site to dive in. Enjoy sightings of turtles, Napoleon wrasses, barracuda, dolphins and manta rays. 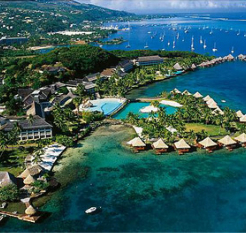 Only 5 minutes from Tahiti-Faa’a Airport and 15 minutes from the Papeete city centre, InterContinental Tahiti Resort is considered the premier destination resort on the island. Boasting a private beach, two freshwater “infinity” pools, swim-up bar, tennis courts, 30 acres of gardens, and a Lagoonarium full of fish and rays that you’re welcome to help feed every morning, the resort truly is a luxurious and magical getaway. The superb dive operation, Aquatica Dive Center, is located on-site. Seventeen over-water bungalows are built around the resort’s very own motu, or islet, and fifteen stretch across the deep lagoon. Individual sundecks and terraces provide over-water bungalow guests easy, private access to the lagoon. Standard rooms, Executive rooms and Suites are located in secluded, tastefully decorated buildings along the water. Choose from garden, lagoon, or ocean view. All rooms have private terraces with furnishings. Rooms are decorated in the Colonial Polynesian style with wood floors and rattan accents. 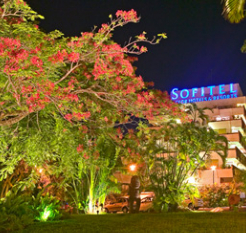 Conveniently positioned next to the airport, on a charming beach surrounded by tropical gardens with views of Moorea, Sofitel Tahiti Maeva Beach Resort is perfect for those travelers staying one night in Tahiti before continuing on to other islands. 216 stylish, light-filled rooms each feature a private balcony with either a mountain or lagoon view, WiFi, plasma TV with satellite service, daybed with sumptuous cushions, a luxurious rain shower and either a king or two single beds. Nestled between mountains and a lagoon is the InterContinental Moorea Resort & Spa. Many of the island’s more popular activites can be found or arranged for you without leaving the resort! In addition to kayaking, canoeing and touring the island by jeep, you also have the rare opportunity to enjoy an educational dolphin encounter….the Moorea Dolphin Center is located on-site! Also located on-site is the superb dive operation, Bathy’s Diving Club. Bamboo floors, along with wood, wicker and bamboo accents, lend an air of Polynesian luxury to the guest suites. Choose from 102 overwater, beachfront and garden bungalow suites, each with a separate sitting area. Except for the garden bungalows, all are air-conditioned. Also available are 52 hotel rooms located in a curved, two-story building. Each of these rooms has a patio or balcony facing the beach. 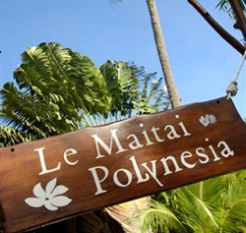 Bora Bora and the famous Matira Point area is where your hotel, Le Maitai Polynesia will welcome you in the highest Polynesian tradition of hospitality. From a beautiful white sand beach, you will have a breathtaking view of the emerald lagoon teeming with brightly colored fish, with neighboring islands Raiatea and Taha’a on the horizon. The architecture, entirely Polynesian in style, provides a local look that blends naturally into the environment along the shore. 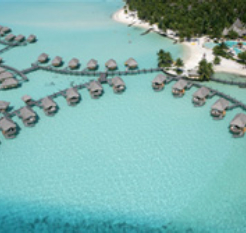 You’ll have your choice of a variety of luxe accommodations…19 overwater bungalows, 7 beach bungalows and 48 air-conditioned rooms nestled amid the lush landscape. All offer a terrace or balcony and similar furnishings: King size bed, IDD phone, TV, shower with hair-dryer, in-room safe and refrigerator. The bungalows feature natural ventilation and overhead fans while the garden and ocean view rooms are air-conditioned. Upon arrival, enjoy a refreshing tropical cocktail in the lobby before you are shown to your room. Our front desk, with its activities and excursions department, will assist you during your stay and help you discover Bora Bora. You will find hotel merchandise in our boutique, as well as local black pearl jewelry and many other souvenirs. Also, a separate lounge featuring internet access can be used during the day to relax or for small banquets and meetings. Our Haere Mai Restaurant offers buffets, menus or a la carte food showcasing a combination of local tastes and international cuisine with a French touch. Additional dining options include a garden-setting bar and a snack bar on the beach. 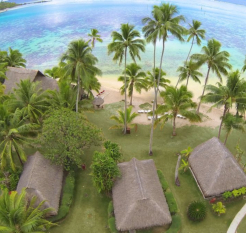 The Bora Bora Pearl Beach Resort & Spa is located on Motu Tevairoa (the islet of abundant waters) facing the beautiful and romantic island of Bora Bora, an enjoyable 45 minute flight from Tahiti. The 5-star “Pearl of the Pacific” is situated on 48 acres of land and boasts 50 idyllic Polynesian-style bungalows built over the iridescent lagoon. In addition to the exquisitely crafted over water bungalows, 10 beach suites and 20 garden pool suites are offered. All feature ceiling fan, air conditioning, coffee and tea makers, mini bar, hair dryer, safety box, iron and ironing board, magnifying mirror, 20″ LCD satellite television with DVD player, IDD telephone and CD player. The over water bungalows have glass tables for viewing marine life in the lagoon, large sundecks, sitting areas and direct access to the lagoon. Premium over water bungalows feature the best views of the lagoon and Mount Otemanu. The 10 beach suites are adjacent to the white sand beach and feature a lounge area facing the beach and a private enclosed garden with Jacuzzi. The 20 garden pool suites feature a private tropical garden, plunge pool and covered resting area. Coral Nursery located beside overwater bungalows – perfect for snorkeling! On the edge of a beautiful azure lagoon, 38 traditional Polynesian stlye bungalows are situated within lush, exotic gardens. This is the Novotel Rangiroa Lagoon Resort. Each of the spacious and comfortable bungalows offers air-conditioning, satellite tv, mini-bar and an attractive garden or lagoon view terrace complete with table and chairs. 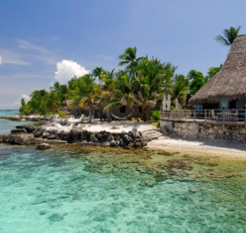 Hotel Kia Ora Resort & Spa is located between 2 passes on the northwest part of the atoll of Rangiroa. The resort was completely renovated in 2011, and now offers 60 exceptionally styled villas and bungalows scattered throughout a magnificent coconut grove, on the beach and overlooking the lagoon. 10 spacious Overwater Bungalows feature a main room with king bed, desk and sitting area with sofa. A glass floor window offers a glimpse of the lagoon below. The modern bathroom has a separate shower, two sinks and a sunken bathtub between two glass fixtures revealing the lagoon. Outside the bungalow, a solarium is decorated with two padded lounge chairs and a shaded dining table. The terrace is also equipped with a staircase leading down to a swimming platform at water level. 19 Standard Beach Bungalows are set along the white sandy beach between coconut trees. All have a private outdoor jacuzzi surrounded by a spacious deck overlooking the lagoon. Both the bedroom and the living room open to the terrace. The bathroom is decorated with coral and equipped with two sinks, shower and separate toilet. 3 Beach Suites offer a two-story duplex configuration. The upper floor houses an elegant king bed and enjoys breathtaking views of the sea. On the lower floor, a second bedroom and living room open onto a private terrace, decorated with a hot tub. The bathroom, also located on the lower floor, features a beautiful mirror surrounded with black mother of pearl shells. 3 Deluxe Beach Bungalows are equipped with a king bed, sofa, desk, several storage cabinets and a splendid terrace overlooking the beach next to a private jet-steam swimming pool. The main room and the bathroom are separated by frosted glass panels and carved wood. Behind the bungalow, a coral wall has a flat open-air bathtub lined with tropical plants. 20 luxurious and contemporary Pool Villas are located in the heart of the coconut grove. An open floor plan allows bedroom, sitting room and bathroom to fit into the same space with generous volumes. The outdoor courtyard has a private swimming pool, a wooden terrace equipped with padded lounge chairs and dining table and a garden with an open-air bathtub. 4 Junior Suites are modeled after the Pool Villas, but have a larger internal space, consisting of a separate double bedroom, a bathroom and a lounge that can accommodate a third bed. For the ultimate in luxury and prestige there is also 1 Executive Suite with two separate bedrooms, two bathrooms and a living room, all arranged around an interior patio with swimming pool. For travelers in search of a Robinson Crusoe style hideaway, the hotel also features five traditional style bungalows located on a private island, just an hour away by boat. For your culinary delight, the resort offers 2 restaurants and a bar. Te Rairoa Restaurant combines tropical flavors and aromas with international dishes. The gastronomic restaurant Te Poerava serves dishes that will surprise your taste buds. Enjoy a cocktail at Miki Miki Bar while admiring one of the most amazing tropical sunsets over the lagoon of Rangiroa. Watch the sun set over Moorea from a lagoonside table on the lawn while enjoying amazing French food with an island twist. A more romantic setting would be difficult to find on the island. Located at InterContinental Tahiti Resort, this gorgeous over-water French restaurant is perhaps the only one that can rival Le Coco’s. 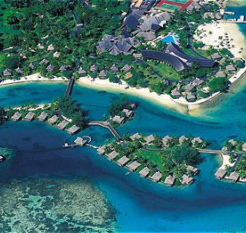 Le Lotus has got it all…ambiance, an amazing view of Moorea, gourmet food and outstanding service. This Italian restaurant in a garden setting serves great wood-fired pizzas and pasta. For heartier fare, steak and veal are also on the menu. Enjoy strong French coffee and pastries for breakfast or a tasty midday sandwich. One of the best values in Tahiti, this restaurant offers a nice view, very good international cuisine, and live music on Friday and Saturday nights. A local favorite, this restaurant features Casual French cuisine. Expect lighter sauces, fresh seafood dishes and the house specialty…lobster ravioli. Located at Hotel Les Tipaniers, this restaurant is popular for its variety of delicious pizzas and pastas. Mahogany tables and local art lend an inviting atmosphere while the French/Chinese cuisine makes for an interesting variety of choices. Excellent Cantonese dishes, fresh seafood choices and the use of puff pastry highlight the menu. For casual island fun, this is the place to be. Kick off your flip flops and sink your toes in the white sand floor while enjoying a sunset cocktail and the specialty of the house….barbequed fish and steak. Reservations strongly recommended. If fine dining is what you’re after, then the finest in all of French Polynesia can be found in this tiny, exclusive restaurant. The exquisite cuisine is French with Polynesian influence. Order a la carte or choose one of the multiple-course prix fixe menus. Reservations for one of the six tables should be made well in advance. This American-style snack bar across the road from Matira Beach has been serving quick, delicious meals to tourists and locals for twenty years. Breakfast sandwiches, fresh tuna-salad sandwiches, pizza, tacos and more are up for grabs. This delightfully casual restaurant with a crushed coral floor features lighter French fare. Toasted sandwiches for lunch and fresh fish for dinner round out a menu full of Polynesian-inspired choices. If you’re in need of a burger and fries, head to this lagoon-side snack bar. 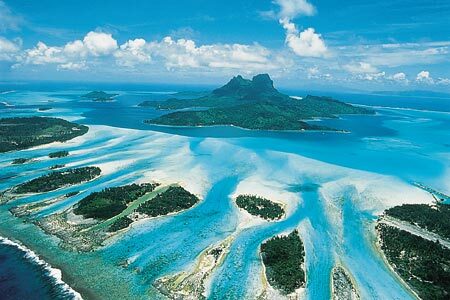 The islands of Tahiti (French Polynesia) are located south of Hawaii, east of Australia and west of South America. How long are the flights to Tahiti? From Los Angeles, it takes 8½ hours to get to Tahiti. 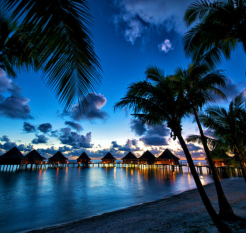 Air Tahiti Nui offers non-stop flights from LAX to Tahiti. From New York, your travel time may be closer to 16 hours including stopovers. French and Tahitian are the official languages used. English is widely spoken and understood in tourist areas. U.S. citizens who are staying for less than 30 days in Tahiti do not need a visa. However, you will need a valid passport and an onward/return ticket. They use 110 or 220 volts depending on your location. It is advised that you carry your own converter or adaptor. It depends on the hotel/resort that you choose to stay at. However, when it comes to your diving transfers, the dive centers provide roundtrip hotel/dive center transfers. Lagoons, oceanic drop-offs and passes. Black and white tip sharks, lemon and grey sharks, multitudes of colorful reef fishes, dolphins, mantas, giant Napoleon wrasses, and schools of jack, tuna, barracuda and snapper. First dive boats usually leave around 8am. Second dive boats depart after lunch. The end of your dive day depends on whether you have a third or night dive scheduled.